I have read Anne of Green Gables too many times to recall, but I think this is perhaps only the third time for Rilla. It challenges Anne as my favourite of the series, and I am not ashamed to say I cried on four separate occasions whilst reading it. Set from 1914-1919, the immediacy of the events of the war makes this a fascinating record of life on the Canadian home front filtered through the lives of the Blythe family and their neighbours in the tiny village on Prince Edward Island. There is a perfect blend of humour, romance, levity and predictability to counterbalance the very real suspense, terror and heartbreak experienced by the characters (and readers!). I was intrigued by the series when I read Samantha's review, and pulled it from my daughter's shelf. I'd never paid much attention to it because of the flashy cover and the flimsy page quality, but I did enjoy this book a great deal. The quality of writing is stronger than I had expected, the characters were well-drawn and interesting, and, like the Harry Potter series, the magic was an added feature in the fictional world rather than the sole point of the narrative. The characters still had to work through their issues - a magic spell could not always conveniently solve their troubles. Once again I have learned my lesson about judgements regarding covers, etc. and go read Samantha's review! She does a wonderful job exploring its merits. 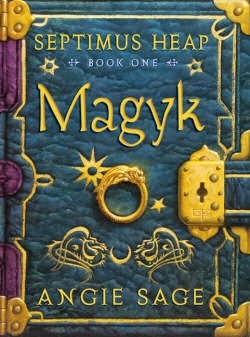 I'm so delighted that you read (and enjoyed) Magyk! I hadn't stopped to consider the use of magic - I've read so much fantasy that the existence of magic doesn't make me bat an eye - and you're absolutely right, Sage's world has magic as a bonus, not its basis. I just finished reading the second one in the series and didn't find it nearly as good (though according to goodreads, I may be in the minority with that opinion). Also, thanks for the reminder that I need to read more Montgomery! I've only ever read The Blue Castle and Anne of Green Gables (not even any sequels). This one sounds lovely - must I read Montgomery's books in order, or can I skip straight to Rilla? I think it would be fine to read "Rilla" on its own. The story really is her story, and most of the others are supporting characters. "Rainbow Valley" would be the book that would offer the most interesting background if you wanted to read more. It was written and published two years after "Rilla", but comes first in the fictional chronology (which leads to some interesting foreshadowing!). "Rainbow Valley" is the story of Anne and Gilbert's children when they are young - I think Rilla is six - and their adventures with the Meredith children, and "Rilla" begins about nine years later when Rilla is fifteen. Personally, I have found great discrepancy in the writing of the series. The much later books (Anne of Windy Poplars, Anne of Ingleside) are much different and not quite as vibrant as those written earlier. I wouldn't miss any of the series though! It's always been my plan to read all L.M.Montgomery's work in the order in which it was published. Maybe next year! I have this on my nook, from the days when Barnes and Noble gave away good books on Free Friday. Now I think I can get to it after your fine review. I've recommended "Magyk" to my daughter who is twelve, although I think it would be appropriate for children much younger. It's a long book (550+ pages) but would be a wonderful challenge for some of your students who are strong readers. I must confess that I like the coper of Magyk. Though admittedly flashy, I think that the colors work well and I like the symbols. It sounds like a well written and fun book. I've been thinking of reading the L M Montgomery books for a while, I think I only ever read Anne of Green Gables when I was a child. Rilla would be a perfect choice for the Virago LibraryThing WWI project for the home front category, Ali. I'm really excited to read the Emily books again. I haven't read them since I was a child. The selected journals came out in 1985, but the complete editions are being published now so it seems a good time to dive back in. Maybe a group project for 2015? Like Samantha I've read The Blue Castle (loved it; reviewed it recently if you're interested) and the entire Anne series a couple of times. It is very remiss of me to have missed Rilla's story, but I lost interest during Rainbow Valley and never took up the story after that. Have you been able to find a copy of The Blythes Are Quoted? I would love to know more about this one and if it's worth my while to hunt down or not.